High Voltage Direct Current (HVDC) power is well suited to moving massive amounts of power over long distances. For example, the Xiangjiaba – Shanghai has capacity equivalent to approximately 7 nuclear power plants and spans a distance of abou 1300 miles. The High Voltage reduces losses as well as solving a variety of other technical challenges. The use of HVDC dramatically reduces the width of the transmission line right-of-way thus diminishing the impact on property owners. This technology offers an excellent approach to bringing wind power from the interior of the US to the large loads on the East coast. This is discussed in detail in this post. UPDATE Dec 2015: ABB is making considerable progress in the development of +/- 1100kVDC see HERE . 2013 Report to DOE on the status of UHVDC HERE . Figure 1: Right-of-way widths for overhead 6000 MW transmission lines in meters. 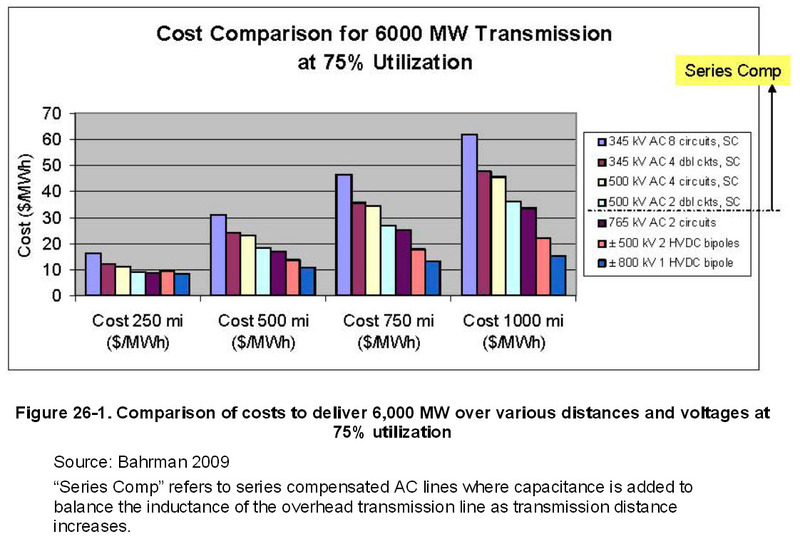 Figure 2: Relative cost of various transmission options. For perspective, 345kV lines do most of the heavy lifting in the US. 500kV lines are rare and 765kV lines are extremely rare. Another graphic below, from NREL’s Renewable Electricity Futures report, offers additional perspective on transmission line right of way width. 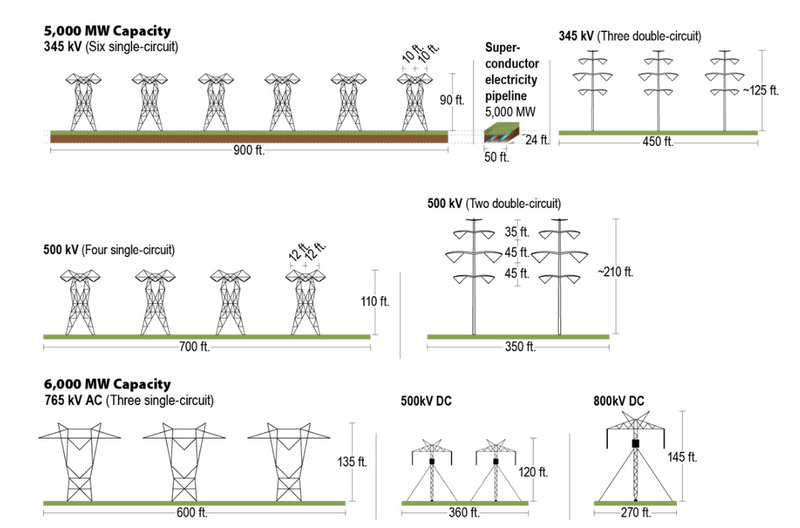 To compare this to the graphic above, note that you need to add two additional towers to the 345kV example below. In other words, for a 6 GW transmission line you would need a right-of-way of about 1200 ft for 345kV versus 270ft for a bi-polar 800kV DC line. The HVDC structures themselves can have very low footprints. Though the ones in these graphics are shown guyed, other structures have minimal ground footprint making them very compatible with farmland. Figure 3: Right-of-way widths for overhead 6000 MW transmission lines in meters. Opponents of wind power argue that the cost of power transmission from remote sites should be reflected in the price of the wind power rather than being part of the general ‘lines’ charge that is shared by everyone. This approach is being developed by Clean Line Energy . Clean Line Energy has proposed HVDC to carry power from midwest to points west and east. Their business model is to have the wind farm owners pay them. So this concern is fully addressed. Assuming they did their due diligence it would appear that wind is cost effective even when paying for the transmission line extensions. This is undoubtedly due to the extremely high capacity factors available in these remote locations. Wyoming to CA transmission line efforts offer a case study and work in progress. After nearly a decade of permitting and approvals they inch closer to a HVDC line to carry power from WY to CA. More on this project HERE. Also beneficial for interconnecting different grids over short distances as the Tres Amigas station will soon do with the three US grids. There are other innovations in the development phase which could reduce cost and footprint of HVDC. Roger Faulkner’s Elpipes are an interesting concept that gets the powr lines underground reducing footprint, cost and vulnerability to terrorism. This entry was posted in T&D The New Grid and tagged grid expansion. Bookmark the permalink.